What would you think of someone who gave you the secret of life? Do you think you might instantly call him your best friend? You bet! That’s what the Holy Spirit did for you. The Holy Spirit gave you the secret to, not only life, but eternal life! He convicted you of your sin. He drew you to Christ (John 6:44). Don’t get the idea that anybody can simply come of his own will and his own volition to Jesus Christ. No one could come; no one would come except by the Holy Spirit. The Holy Spirit has given you the secret of life. And He has drawn you there Himself! That’s some best friend, wouldn’t you say? Don’t keep quiet about your Best Friend today. He wants to be known and He’s given you the privilege to be His messenger. Share Him with those you care about today. For more from Love Worth Finding and Pastor Adrian Rogers, please visit www.lwf.org. 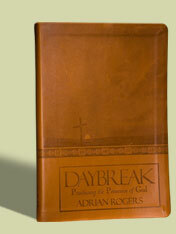 You can also listen to Adrian Rogers at OnePlace.com by clicking here. Originally published April 04, 2009.